Bring a little festive cheer to your garden this year. Covered in buds and ready to flower its heart out, this glorious flowering Camellia will bring some much needed Christmas cheer to your garden. Flowering through Christmas and into early spring, the cheery red blooms are absolutely breathtaking! Typically festive in red and green and far less expensive than other suppliers. Year-round interest with evergreen leaves - this is a plant that you really need in your garden. Bring a little Christmas cheer to your garden over winter with this glorious flowering Camellia - we can't sing its praises enough as it's bursting with buds and just waiting to erupt into glorious colour! 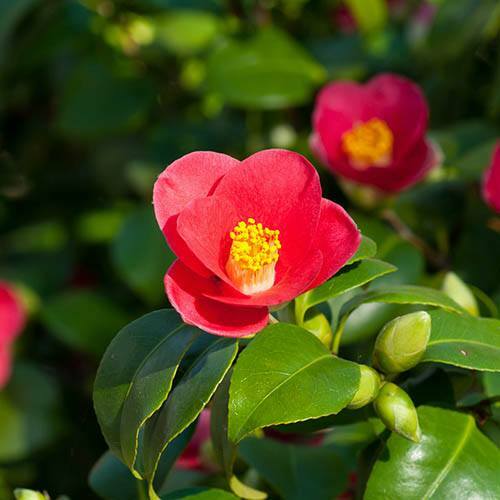 Unlike many of the usual winter-flowering plants, Camellia 'Yuletide' will flower through Christmas and into early spring, with an abundance of brilliantly coloured, red blooms, each with a glowing cluster of golden yellow stamens at the centre - really eye-catching and very distinctive. Typically festive in sumptuous red and green, the luxurious flowers shine against the glossy leaves, making this compact shrub ideal as a Yule centrepiece in the garden - it can even be brought inside over Christmas in a pot as an unusual decoration, just remember to return it outside once the festivities are over. Plus at less than half the price of other suppliers, it really is worth grabbing one now! More than able to bring winter interest to any garden border, you can even grow 'Yuletide' in a container, so even without a garden you can enjoy the magnificent display of flowers. Fully hardy and easy to grow, there's no need to worry about complicated pruning, just snip off any branches that are dead, diseased or dying - so not only is this camellia easy on the eye, it’s easy to grow too! Grow Yuletide in a sheltered, partially shaded position out of drying winds in a moist but well-drained, fertile soil which needs to be acid in nature - if planting in a pot, use ericaceous compost. Supplied as an established plant approx 40cm tall in a 1L pot. Early morning sun will damage frost-covered buds, so be sure to plant in dappled shade where the sun doesn't get to the plant until late morning. To prevent damage to the buds and flowers protect from cold, dry winds and early morning sun. Water established plants in dry weather to prevent bud drop, especially in the summer months when the buds are forming out of sight. Apply a balanced liquid fertiliser in mid-spring and again in June and mulch annually with shredded bark or well-rotted leaf mould. After flowering, lightly trim or prune any branches that spoil the appearance of the plant.